Does your front garden cut the mustard? You are here: Home › Garden design › Does your front garden cut the mustard? • Comments Off on Does your front garden cut the mustard? There may not be much actively growing in the garden in winter but now is the perfect time to take a long, hard look at your front garden and decide if it could do with some tweaking. We all want to walk or drive home and be greeted by a garden that looks like it belongs, emphasises the best in the house and is beautiful in its own right. Soil, sun and personal preference will all influence the final choice of plants but firstly you need to consider the three reasons why your front garden is different from round the back. View: a back garden is most often viewed from the house towards the wider landscape. 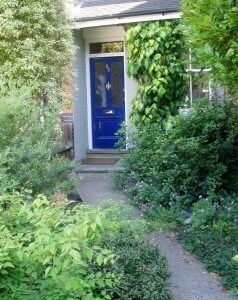 A front garden is almost always viewed from the pavement towards the front door. The house becomes the backdrop to the entire garden and the garden should support the scale and style of the house. Seasons: Large parts of the back garden can be at their best in summer and generally ‘put to bed’ for the winter. The front garden operates all year round; you enter and leave in winter just as much as in summer so you need colour and fragrance all year round, not just evergreens! Use: Unlike most back gardens we do not sit, play or grow food in the front garden and often the majority of space is given over to parking. Try to avoid cars parked right up to the house and vary the surface, even if there is no room for grass. If you are short of planting space choose a few big, bold plants to balance the hardness of drive and house. With a little planning you too can have a great front garden. So get ready to smile as you arrive home.